A clear sky. Low 42F. 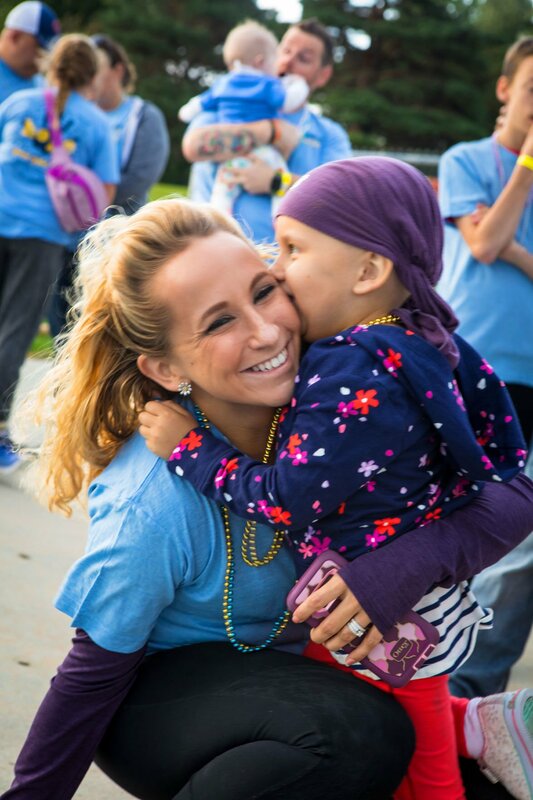 Winds S at 5 to 10 mph..
Amanda Reinert, left, receives a hug from her daughter Ava, who was diagnosed with leukemia at age 4, during a past Glow Gold event held by Sammy's Superheroes Foundation. Cancer families who attended last year's Glow Gold event at Lakeview High School gather for a group photo. In conjunction with the fifth anniversary of Sammy’s Superheroes Foundation, officials are offering free admission to the organization’s biggest fundraising event, Glow Gold Honors, from 3-6:30 p.m. on Sunday at Lakeview High School. Since its establishment in 2013, the organization has raised and donated more than $300,000. This year, officials are aiming to raise $400,000 for the Pediatric Cancer Research Data Commons project at the University of Chicago. Development coordinator Alyssa Theilen said the organization has successfully raised roughly $250,000 for the cause. The Glow Gold event is held yearly in September commemorating Childhood Cancer Awareness Month. On top of raising funds, the event also helps gather support for children with cancer, survivors and their families. Theilen said admission is generally waived for cancer families but decided to do the same for the general public this year as part of the organization’s celebration. Since its inception, Theilen said the event has grown in many different ways -- more groups and families are getting involved. Theilen said the organization has expanded its cancer family reach, noting there will be at least 40 cancer families statewide attending the event. She said there were out-of-state families who attended past Glow Golds, as well. Stanislav said families who’ve lost children to cancer take a long time to heal and the support shown during the event can help them cope with their loss. Theilen said the event will begin with a ceremony recognizing cancer families in attendance by highlighting their individual stories, followed by a choir performance, an honor walk and a balloon release to honor the angels, a term the organization use for children who have lost their lives to cancer. Attendees can expect to enjoy a wide range of activities like bounce houses, face paint, a DJ and photo booth. A number of larger-scale activities will require an all-inclusive wristband for $10 each and food is provided for $5, as well. Because this is the organization’s biggest fundraising effort, Theilen said more than 45 local businesses are sponsoring the event and its silent auction. The majority of event proceeds are gathered through various sponsorships, the silent auction and merchandise sales. Theilen said the success of the event falls back to community support. She said at least 90 individuals from various local organizations, such as Barb’s School of Dance and the Central Community College basketball team, have stepped up to volunteer during the event.